For other uses, see Terminal (disambiguation). Terminal (Terminal.app) is the terminal emulator included in the macOS operating system by Apple. Terminal originated in NeXTSTEP and OPENSTEP, the predecessor operating systems of macOS. As a terminal emulator, the application provides text-based access to the operating system, in contrast to the mostly graphical nature of the user experience of macOS, by providing a command line interface to the operating system when used in conjunction with a Unix shell, such as bash (the default shell in Mac OS X Jaguar and later). The user can choose other shells available with macOS, such as the Korn shell, tcsh, and zsh. The preferences dialog for Terminal.app in OS X 10.8 (Mountain Lion) and later offers choices for values of the TERM environment variable. Available options are ansi, dtterm, nsterm, rxvt, vt52, vt100, vt102, xterm, xterm-16color and xterm-256color, which differ from the OS X 10.5 (Leopard) choices by dropping the xterm-color and adding xterm-16color and xterm-256color. These settings do not alter the operation of Terminal, and the xterm settings do not match the behavior of xterm. Terminal includes several features that specifically access macOS APIs and features. These include the ability to use the standard macOS Help search function to find manual pages and integration with Spotlight. Terminal was used by Apple as a showcase for macOS graphics APIs in early advertising of Mac OS X, offering a range of custom font and coloring options, including transparent backgrounds. ^ "What Is Mac OS X - All Applications and Utilities - Terminal". Apple Inc. Archived from the original on May 10, 2013. ^ Wünschiers, Röbbe (January 1, 2004). Computational Biology: Unix/Linux, data processing and programming : with 19 figures and 12 tables. Springer Science & Business Media. ISBN 9783540211426. ^ a b Kissell, Joe (January 1, 2009). 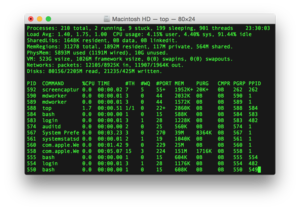 Take Control of the Mac Command Line with Terminal. TidBITS Publishing, Inc. ISBN 9781933671550. ^ a b McElhearn, Kirk (December 26, 2006). The Mac OS X Command Line: Unix Under the Hood. John Wiley & Sons. ISBN 9780470113851. Wikimedia Commons has media related to Terminal (OS X).